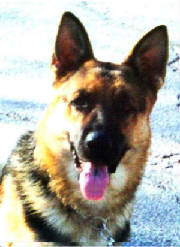 Duke was from 3 generations our selective breeding .He was loved and is missed by many people across the world, whom had adopted puppies from this robust happy loving boy.He is still truely missed by us.He was our big , big baby & one hell of a real working dog.Although his legacy lives on Threw his Sons & Grand Son. 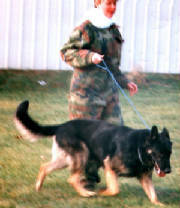 This wonderful boy was out of 5 generations our breeding program.He was the producer of many,many fine family companions/guardians ,obedience achievers,Demonstration Dogs for Training Studios and loved by all adults & children who met him.He was My Personal Helper Dog & Friend .We are proud to have kept 3 of his best progeny for our future from different strong lined dams to match his equal. 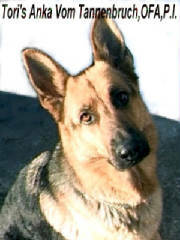 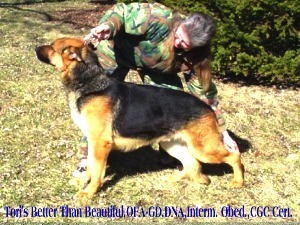 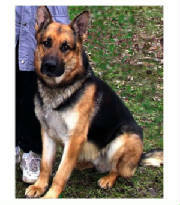 Sire-Tori's Tobias,OFA,DNA,I.S.P.Working Dog/Gita Vom Haus Chi,OFA,P.P.Cert. 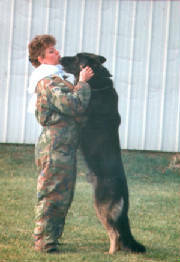 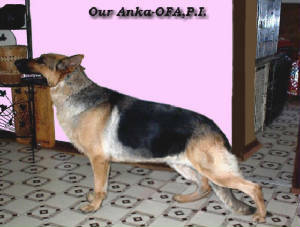 Tori's Anka Vom Tannenbruch,OFA,PP.I., A product of my entire 25 years experience in genetic structure of my idea of the perfect German Shepherd female.Anka was 85 % European 15 % American.She was feminine but not delicate,temperament & character was flawless.She was very dependable as a companion,protector,mother & a very loved family member.Fortunately we have been able to keep several of her daughters from very strong sires.